7/14/99; 2.0 hrs; transported the fuse to the airport. The fuse was moved to the hangar so the wings could be brought into the paint booth. 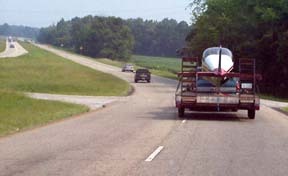 Key ingredients of a successful move is a good crew and properly sized trailer. Crew chief was Randall "Einstein" Eckstein. Randall built the 8'x20' trailer from a set of house trailer axles. Needless to say, he is "De Man" for hauling RV's to the airport. Other crewmembers included James, Michael, and yours truly. 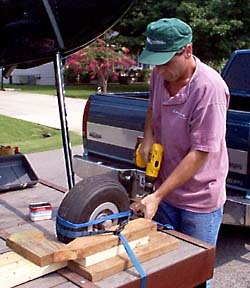 Wood blocks were attached around each wheel and the wheels strapped to the trailer. The canopy cover had to be removed because it was being whipped by the slipstream. Safely in the new home! 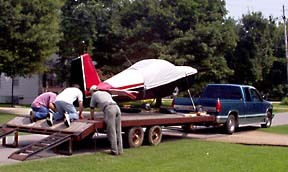 Moving an airplane can be one of the more stressful aspects of the building process if done in a haphazard way. Thanks to a good crew, this move went very smoothly. 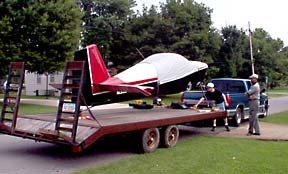 In my files was an RV-List post from Chuck Brietigam about using a Cessna towbar for moving RV's. 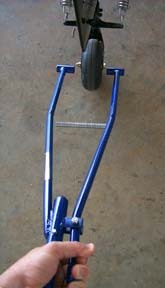 The towbar is available from Aircraft Spruce for just $47.95! 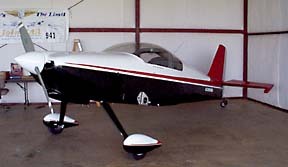 I ordered one to see if it would make moving the RV6 around the hanger any easier. I am happy to report that the towbar seems to be a great RV accessory. Here is the towbar in the stowed position. 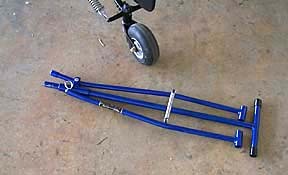 Overall length is such that it will fit nicely in an RV6 baggage compartment. 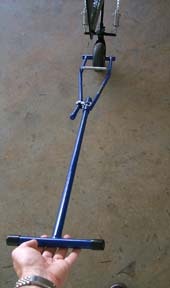 Once the handle is installed, the spring loaded jaws slip over the tailwheel bolt. I had to tweak the cotter pin in the wheel nut to allow the sleeve to slide into place.